Sun and holidays. Guest marinas occupied to the brim while you and everyone out at sea have left lots of empty berths behind. The Mooringo mobile app enables you to borrow or rent berths from private berth owners and harbours who want their empty berths to be used. You can pick and choose among harbours, marinas, bridges and private buoys. Places that has not been available before can now become your new favourites. Mooringo does not only solve the problem of full marinas, it also inspires you to discover new places. Private berths in cosy bays, small yacht clubs and buoys that no one else seems to be using. Mooringo lets you discover hidden jewels as well as new convenient berths. No need to worry about full harbours or about arriving early to succed in finding a berth. Booking and paying is as easy as a click in the Mooringo app. If you need to change your plans, you will be able to cancel your reservation until 24h before initial arrival time and get reimbursed. When you register in the mobile app, you specify what kind of boat you have: length, width, depth and weight. With that information, you’ll be presented with berths that suit your vessel. The idea behind collaborative economy is to use untapped resources for the benefit of everyone. 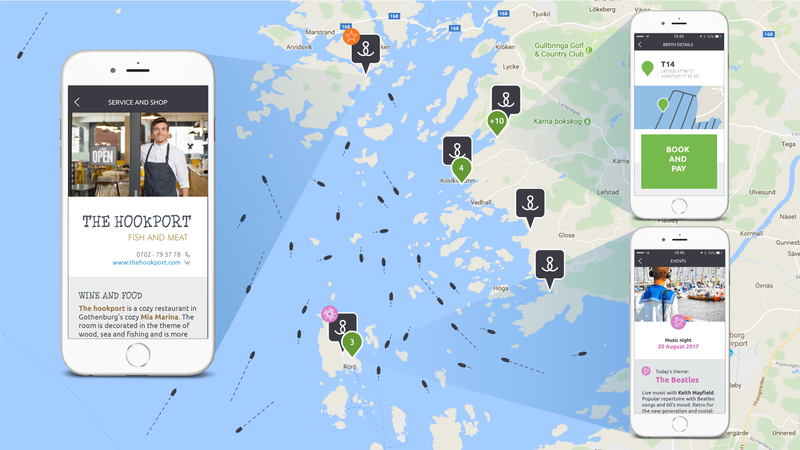 If you own your berth or have a berth that you are allowed to rent out, you can rent or lend it directly in Mooringo’s mobile app and help boaters to discover new places and earn some money at the same time. Enter the location, price and date for when you want to rent it out. It’s that easy, try it yourself. Publishing your berth does not cost anything! 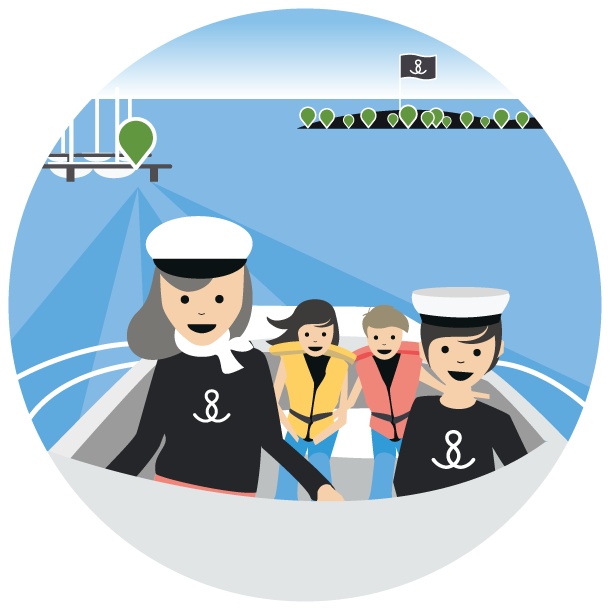 Once published, your berth will immediately appear in the app for those looking for an available berth in your area. This is also where the guest books and pays you. Do you have more than ONE berth? The mobile app is created to handle just ONE berth. If you represent a harbour or have more than one berth you can register as a leisure port thus gaining access to Mooringo MyMarina. It’s an online administrative tool that allows you to manage the way your berths are being booked. Why book and rent berths through Mooringo? You get the opportunity to discover and make use of new berths and buoys. You will get a berth at a marina or at a pier or buoy reserved for you. You do not need to rush to be sure of a berth. You tie up at your convenience without worrying about whether there will be any guest berths available. You do not need to enter harbours without knowing whether or not there is a guest berth there for you. You know that the berth fits your boat. Do I need to have my own berth out for rent to be able to rent others berths through Mooringo? No. You can rent other boat owner’s berths without having your own out for rent. Some harbours don’t allow you to rent or lend your berth. However, you should indicate where your home berth is when you register. No, you can download the app for free. You do not need to pay any membership fees. We charge only when you book and pay through the app. If you don’t book anything, you don’t pay anything. How do I book a berth? You book and pay through the Mooringo app. When you find a berth that is marked as green on the map, you make the reservation with a few clicks. Once you have paid for it, the berth will appear red, occupied, and non-bookable for other users. Can I book more than one berth for the same date? No, you can only book one berth per night per boat. The system will give you an alert if you try to book more. How far in advance can I book a berth? If a berth is available, you can book it anytime. Is there a maximum number of days allowed for a single booking? There is normally no limit, but you can book free of charge berths for a maximum of one day. Thereafter, you’ll need to make a new booking. This is to prevent a single user from booking a single berth for free the whole summer. What do the colours of the pegs on the map mean? Green – Vacant berth that can be booked. Blue – free of charge and available berth. How does the app know what type of berth I'm looking for? When you register you enter information about your boat: length, width, depth, etc. 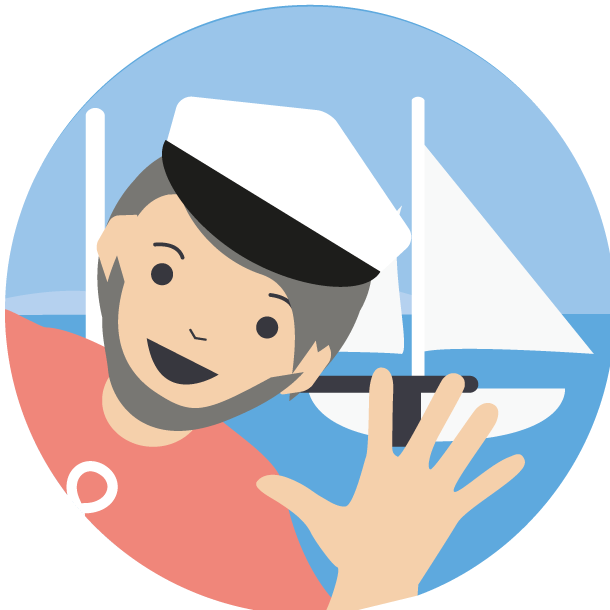 The Mooringo app will then only offer you berths that suit your boat. What if another boat has taken the berth I have booked? Since you have a confirmation in your mobile with contact details of the owner of the berth, you and the boater currently using the berth can jointly contact the owner and thereby resolve the misunderstanding. How much do I pay and how? Mooringo has no fixed price list. The person who rents out the berth sets the price. You pay the price set by the person who rents out the berth, plus a booking fee of 10%. When you have found a berth that you want, you pay via the Mooringo app with your credit card. The money is deducted from your card immediately, to ensure that you actually show up at your booked berth. The person who rents out the berth gets the money a week after the rental has occurred. This is to protect you from paying for non-existent berths, or berths that do not meet their specification. What happens if I want to cancel a reservation that I have paid for? You can cancel a booked berth up to 24 hours before the booked date and get a full refund. No boater can control the weather or other unforeseen events. Are there free of charge berths? Yes there are, they appear in blue on the map. How do I complain about a berth that does not exist or meet the specifications? Step 1 is to contact the person who let out the berth, whose contact information you received when making the payment. Hopefully it’s a misunderstanding that is easily resolved. Step 2 is to contact Mooringo. Since the person who rent out the berth does not get paid until a week after you have visited the site, we can reimburse you the money that you have paid. Please describe in detail what the problem was and what has been said in your discussion with the person letting you the berth so we have as much information as possible when contacting the owner of the berth. Please make sure to contact Mooringo as soon as possible after the problem has occurred. What happens if I do any damage to the berth I rent? You or your insurance company is responsible for handling any damage caused by you. What happens if my boat gets damaged because of incorrect information about the berth? The person who rents out a berth signs a user agreement ensuring that the information provided is correct. If your boat is damaged due to incorrect information from the person who rented out the berth, then the latter should compensate you for it. However, you must prove that the damage occurred in connection with the rental, and because of the incorrect information about the berth. Why rent out your berth through Mooringo? You help other boat owners to discover new places! Make extra money when you are not using the berth yourself. It’s free to advertise your berth. You set the price and availability of your berth. Can anyone rent out their berth? No. Some harbours do not allow their members to either rent or lend out their berths. Nonetheless, you will be asked to specify your berth’s location while registering in the app. Before you rent out through Mooringo, you need to know the rules and regulations that affect you, e.g. your lease, the rules of your yacht club or association and regulations set by your local authorities. Make sure that you fully understand and follow these rules, before you advertise your berth. In discussions with your harbour, you should think about what they need to know about your plans. It may be a good idea to mention the number of days you plan to rent out, and that you can provide contact details of the boater who rents the berth. If your harbour does not allow members to rent out as individuals, you can tell them that the marina club itself can join Mooringo. In this case, the rentall fee will be directly paid to the harbour and you will receive the benefits of our Mooringo Fidelity Plan while notifying through the app everytime you leave the harbour. How do I know who rents my berth? Every guest who books a berth via the Mooringo mobile app has registered their name, phone number and email address. They have also entered some information about their vessel; size and boat name. All this information will be available for you as soon as someone books your berth. Mooringo has no set price list, you decide what price you want to charge. Factors to keep in mind when setting the price are, for example, location, size, harbor facilities, high or low season etc. The guest pays by credit card via the Mooringo app. The money is deducted from the guest’s card directly, to ensure that you get money for your berth when it appears booked in the system. After the rental you will get the money into your bank account once a month. The reason for waiting until after the rental, is to protect the guest from paying for berths that do not exist or do not meet the specifications. You will get your set price. Your guest pays the price you have set plus a guest fee to Mooringo which is the reason why he or she sees a higher total price than you have specified. Mooringo has no legal liability for members’ income from berths. We are neither able nor allowed to provide tax advice. Please consult your local tax agency for accurate information. What happens if someone misbehaves? For example, litters or disturbs? Each and every member of the Mooringo Community can write a complaint to either the owner or the renter of a berth. Mooringo reserves itself the right to exclude from the App anyone that would cumulate negative feedbacks from his/her fellow members of the Mooringo Community. Any damage to boats or berths are to be settled between and by the members. Contact details are to be found in the booking details. If the guest causes damage to the berth, the guest is responsible for paying these damages. Usually this is covered by the insurance of the boat. If the guest’s boat is damaged due to incorrect information from the person who rented out the berth, then the latter should compensate for it. However, the guest must prove that the damage was made in connection with the rental, and because of incorrect information about the berth. How do I make sure that no one will use my berth without paying? We cannot guarantee that no-one will use your berth without paying when you are away, which of course can happen whether you are using Mooringo or not. Your berth will appear green and vacant in the Mooringo app, until someone books the berth. If someone else is using the berth illegally on arrival, they shall be invited to leave by using appropriate legal means. What do I do if I come back earlier than planned to my berth? If you come home earlier than planned, simply adjust your schedule accordingly in the Mooringo app. If there are bookings made already for dates when you need your berth, then you either have to honour that agreement, or contact the guest to see if you can come to another solution. Can I share my berth for free? Absolutely. Neither Mooringo nor you will then make any money, but there will be more guest berths available. We like that! What do I do if I want to post more than one berth in the app?